Power of Point & Click Series – 2 : Learn how to Set up recurring Time-based workflows in Salesforce! This is one of the most common requirements I have seen with many of the customers and one of the most widely asked questions in the Salesforce success community. So I hope this post will help them to take this example as a reference and set up something similar. 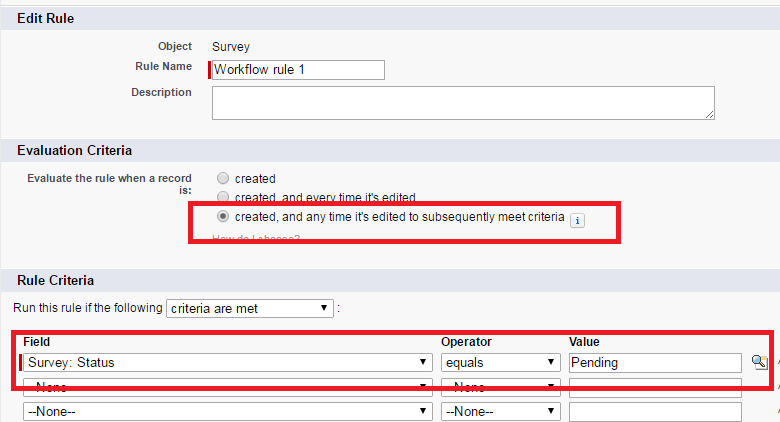 Use Case : ABC Company has a custom object called Survey and a Status field which can have only three values i.e. “New”, “Pending” and “Completed”. They have a requirement wherein once the status of the record in Survey is set to “Pending”, an email should be sent to the Owner of the record every day until the Status of the record is set to either “New” or “Completed”. Implementation : Most people will resort to an apex batch job which will be scheduled to run everyday and check the status of the record and send out an email. However, why to go with apex customization when this can be easily achieved using Workflow rules ? So, let’s get Started. We will basically need two workflow rules to set up recurring workflow rules. 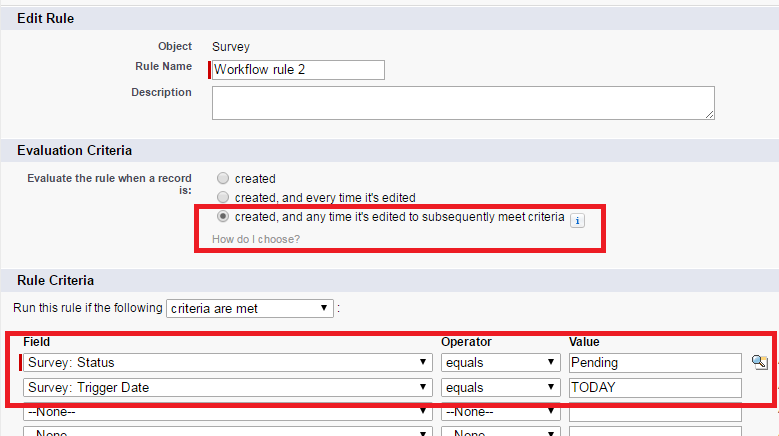 The first workflow will just have the criteria to check whether the Status is set to “Pending” and will be like below. So, the field update for this workflow will be tricky, such that the field update action of this workflow should trigger another workflow which will then trigger in a recurring form. 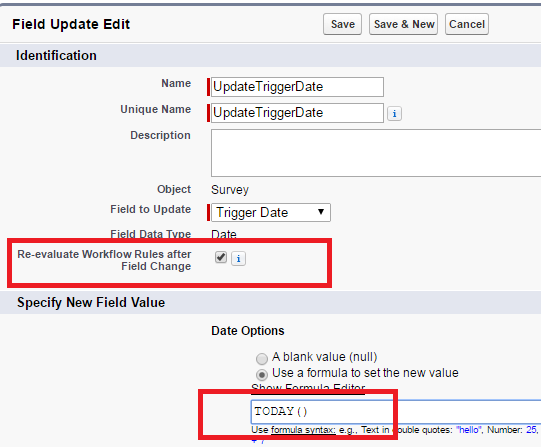 To do that we will need to create a custom Date field in the Survey object. Let’s call it “Trigger Date”. So what we would essentially do is that set the Trigger Date value to TODAY() in the field update action for this workflow. Note that you need to check the “Re-evaluate workflow Rules after Field Change” checkbox, so that we can allow this field update to trigger another workflow which we will setup next. The second workflow will have the criteria to check whether the Status is equal to “Pending” and additionally also check whether the Trigger Date value is equal to TODAY (the date on which the rule is fired). This means that this second workflow will get immediately fired on the same day, when the Status was set to “Pending”. Our second workflow will look like below. Now, we need to set the Field update of this Workflow in such a way, that it will trigger this workflow again. We will have two Workflow actions for this second workflow. The first one is to send an email alert to the Owner of the record which is pretty simple to setup and so I will not dive into the details of this action. The second workflow action is again the same field update that we used for the first workflow. However, this will be a time-triggered action in this workflow wherein the field update action will fire one day after the Trigger Date value. So the immediate and time-triggered actions for your second workflow will look like below. Just Activate both your workflows and you will see the magic happen ! Now, let see how this works end-to-end. The update to the trigger Date field will fire the second workflow since the criteria for the second workflow is now satisfied. The second workflow will immediately send an email alert to the owner and additionally queue the field update action to be triggered on 2nd Jan 2016. The queued field update to Trigger Date is fired on 2nd Jan 2016, thus again triggering the second workflow and queuing the field update action to fire on 3rd Jan 2016. This will keep on happening until the Status is set to “Completed” and the second workflow’s criteria will no longer be satisfied and the workflow will stop working. Previous Previous post: Power of Point & Click Series – 1 : Tricky ways to use roll-up summaries to your best ! Next Next post: Power of Point & Click Series – 3 : How to build formula in Salesforce Reports ! This is pure Gold ! Thanks for sharing ! I’m having difficulty with this. If I send you some screenshots would you be able to help me figure out the issue with my workflows? 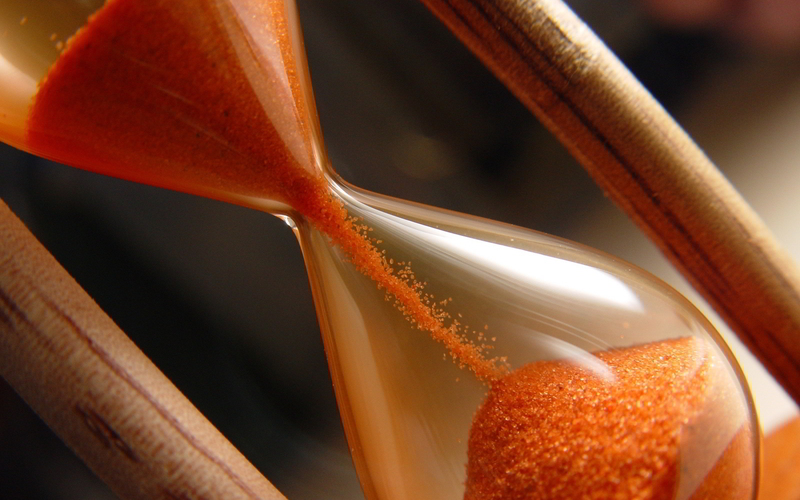 The 2nd workflow time trigger fired but it did not send an email out. I see its scheduled another update after a day too. Let me know.I am also trying to use it. For the first time, immediate action email I am getting. 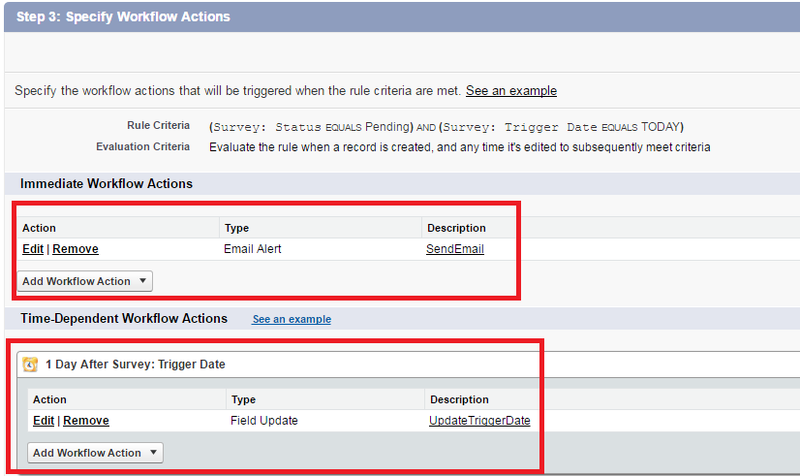 But after a day, when it is queued up and getting executed, it is updating the trigger date field but not sending email. Also, next time execution not queued up in the Time-Based Workflow queue. Only first iteration is queued. Somehow criteria is not matching for the successive iterations. First time it is executed, second time onwards it is not executed. can you please tell me what is the problem. is it working for u? can you please help me i am also faced same problem. If you see the actions scheduled in the queue, then the issue is definitely not to do with the workflow configuration. Instead it is more related to email deliverability set in your organization. Double check and test the email deliverability settings of your org. I’m having the same issue. I’m not trying to create a task instead of sending an email, so I know that’s not the issue. I initially had the same problem described by Venkat. Please make sure that your Workflow Time Trigger is set to “1 Day after [DATE FIELD NAME]”, NOT “1 Day after Rule Trigger Date”. This should fix the issue. I used this strategy to schedule recurring email alerts but somehow it is not working as expected. It only sends an email for the first time. I also tried to make changes based on above comments (to time trigger based on date field) but that didn’t work as well. Am I missing anything? Did this work for any of you? Just works the first time like everyone is saying. I hope this is not off-topic, but could you advise please if this can also work for my case? I was trying to send an email alert using WF rule but the field I created in my custom object was a formula field so it is not firing naturally. My use case is I need to send email alert to the owner whenever his contract is in Pending/Open/Review status, and the contract’s LastModifiedDate is 30 Days. Basically, I am emailing people whose record has no activity in the last 30 days. Our Last Modified Date field is configured such that it covers both contract record editing and activity such as attachments or notes, so I have no issue with my lastmodifieddate. Do you think I can also use this approach here? Thanks so much for your kind response. So glad that I found this blog; I thought my problem is somewhat related. I think this approach should work in your use-case as long as your LastModifiedDate field is not a custom formula field ?